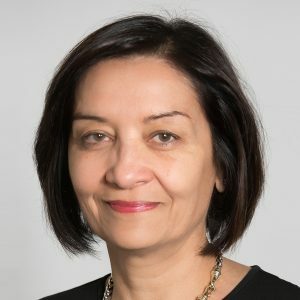 Dr. Nina Bhardwaj is an immunologist who has made seminal contributions to human dendritic cell biology, specifically with respect to their isolation, biology, antigen presenting function and use as vaccine adjuvants in humans. She is the Director of Immunotherapy at the Icahn School of Medicine at Mount Sinai (ISMMS) and holds the Ward Coleman Chair in Cancer Research. Dr. Bhardwaj brings expertise in human immunology and a variety of immune therapies, having developed Toll Like Receptor (TLR) agonist- and dendritic cell-based vaccines for the treatment of both cancer and infection in several Investigator-Initiated studies. Dr. Bhardwaj is an elected member of the American Society of Clinical Investigation and the American Association of Physicians, a recipient of the Doris Duke Distinguished Scientist Award and was named one of the Scientific American Magazine’s Top 50 Researchers, receiving the Award for Medical Research in 2004. She received the Fred W. Alt Award for new discoveries in Immunology in 2015 from the Cancer Research Institute. Dr. Bhardwaj is a senior editor of the AACR Cancer Immunology Research journal, senior editor for Frontiers in Immunology and consulting editor for the Journal of Clinical Investigation. She has also served on NIH Study Sections and multiple advisory councils. This past year, Dr. Bhardwaj was chair of the Cancer Immunology Steering Committee of AACR. Dr. Bhardwaj has also successfully acquired multiple federal and foundation grants and has authored over 200 publications.